In small- and medium-sized churches, maintaining the church website, like most tasks, usually falls to the pastor. Even though designing a website is nothing like the traditional pastoral responsibilities of praying, preaching, counseling and overseeing, pastors are expected to take on this responsibility. If you’re the only pastor or part of a small pastoral team, you can’t afford to let your church’s website go ignored, but you also shouldn’t let maintaining it detract from more spiritual pastoral tasks. Here are some tips on how to design a website that you can easily and quickly update. Sermon Systems with audio, video, scriptures, text etc. Companies that work with churches every day will more than likely provide everything you need in one easy to use package. These are websites and feature sets that have been developed with the feedback of thousands of churches. While you can adjust text yourself in a what-you-see-is-what-you-get (WYSIWYG) editor, it’s unwise to routinely change a site’s text through such an editor. Changes made in WYSIWYG editors aren’t always carried over during significant updates, so any alterations you make to text in one of these editors might have to be manually redone if you ever decide to change the theme of your church’s website. In contrast, the text standards set in the coding of your church’s site can easily be carried over during a major update or change. Thus, it’s preferable to only use WYSIWYG for occasional adjustments. Most of the time, you should rely on the coded defaults to determine how text appears on the site. Every church website should have a calendar that lists all upcoming events, and it should be easy to maintain the calendar. No one wants to spend lots of time entering new events into the calendar each week because doing so can quickly take up a lot of time. Even at a small church, there may be a half-dozen events each week, if not more. Pastors sometimes want to include a blog on their church’s website, and there are usually two reasons behind this impulse. First, many church websites (as well as many websites in general) have blogs. Second, blogs give pastors yet another platform for proclaiming their messages. Your church’s site doesn’t have to have a blog, though, and it may be wise to forgo this feature. Good blog posts take a lot of time to write, and finding pictures to accompany them only adds to how long they take to create and post. Often, they go neglected. A good blog can help a website, but a neglected one will cast a negative shadow over your church’s site. Color is one factor you’ll have to consider when settling on a final website design. When selecting a color scheme for your church’s website design, avoid choosing colors that have a seasonal bent. For example, you might not want to use a red and green scheme, as these are Christmas colors. Similarly, you might not want to use an overly blue scheme if your church is liturgical, as this is the predominant color of Advent. While a website with a seasonal scheme would look great during the appropriate time of year, it wouldn’t look good outside of that particular season. You could update the color scheme for each season, but this takes time–especially if you’re unfamiliar with how to do so. Your church’s site will be easier to maintain and look better if you choose a color scheme that’s suitable for all times of the year. It may be impossible to find a color scheme that’s free of any seasonal color, but the theme shouldn’t be overly suited to any one particular time of year. The best design will look equally good during Christmas, Easter and the summer. As you set up your church’s website, keep in mind how much time it will take to maintain the site. Whenever possible, automate and simplify the process. 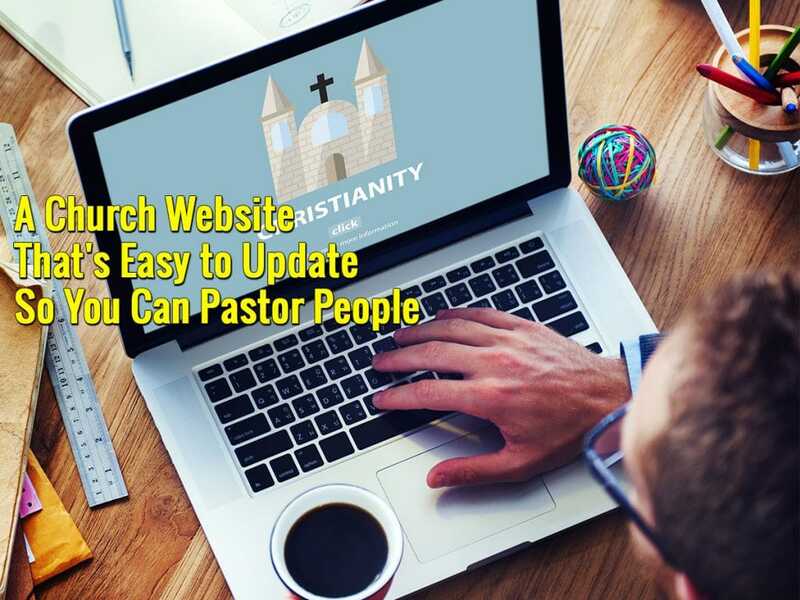 With a good theme and the help of an experienced church website designer, you should be able to create a site that is easy to maintain so you can continue to focus on caring for your flock. ← Is Your Church’s Member Directory Online Yet?